Browser-based access crafted for key business roles. Following user-experience design workshops, business roles are crafted and deployed to the portal, tailoring the data, functions, and reports to each role type. 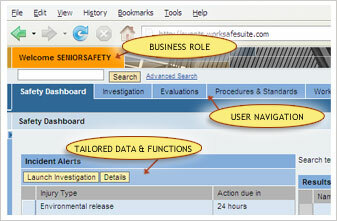 However, a key component to implementing WorkSafe Suite modules is user-centered design. Linx/AS conducts user-experience workshops (employing our UEx Methodology) to properly design your business roles, configure the optimum environment, and test with the user base prior to deployment. Increase user adoption and satisfaction to ensure successful project. Increase user productivity through a well designed solution. Mitigate errors and associated risk to the organization through a properly designed solution. © 2007-2019 Linx/AS, LLC. All rights reserved.